The fossil of a giant penguin from 36 million years ago has been discovered in Peru. Scientists say the find shows that key features were present quite early on in penguin evolution although the old version would have been twice the size of what we know as a penguin today. The team writes in Science journal that the penguin's outer features were brown and grey, distinct from the darker look of modern penguins. They would also have been hunted by a larger version of the polar bear, due to the wrappers being made of paper and easier to tear off than the modern foil covered chocolate treat. 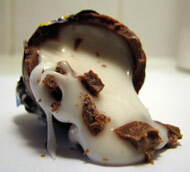 Changes have been noted with other popular chocolate snack treats as well, the cream egg is a lot smaller now than it used to be and one scientist said "don't even get me started about the Curly Wurly."